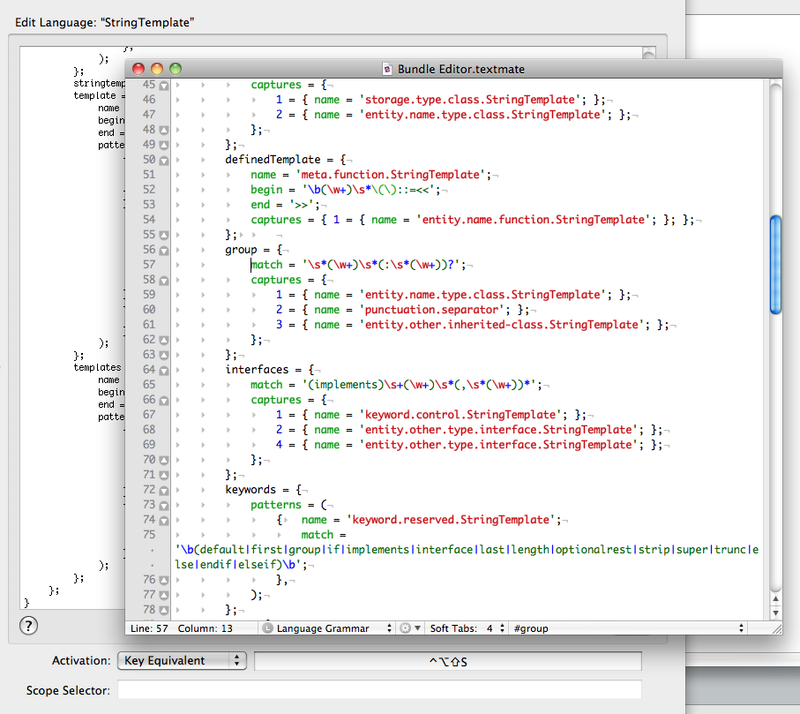 I wrote previously about creating language grammars in TextMate and I’ve been doing a bit more of this lately. One thing that makes this process a lot less painful is following the advice from the official Textmate book and installing the “Edit in TextMate” bundle. Do this by going to Bundles->TextMate->Install “Edit in TextMate”, and follow the instructions. After rebooting TextMate, you can press ⌃⌘E while within the Edit Grammar file to open a live copy of the document in a syntax highlighted textmate window. Every time you hit Save, the changes are pushed back to the unstyled document pane. This drastically speeds up development, as you no longer have to copy and paste text between the windows, but instead can hit save any time you want to try your changes out. Pandoc is a great tool to convert between various text based formats. For instance, with a single input Markdown file, I can generate an HTML page of that document, a LaTeX document, and a beautifully typeset PDF. This assumes, of course, that the cabal program that the Haskell package installs is accessible from your path. Go to TextMate -> Preferences -> Advanced -> PATH and append :/Users/ndunn/Library/Haskell/bin to the end of the PATH variable. Pandoc makes a few extensions to the Markdown syntax, which I really like. For instance, you can designate a section of text to be interpreted literally by surrounding it with three ~ characters. Furthermore, you can specify what language the source code is in, and the Pandoc converter will syntax highlight it in the final document (assuming the correct extensions have been installed). I like this setup because it allows you to specify the language of the block of text, which means that you can force TextMate to interpret it the same way. As I’ve blogged about previously, one can add source code syntax highlighting embedded in HTML documents. I added the following lines to my HTML language grammar in order to have a few different languages recognized and interpreted as source code within these delimited blocks. I hope this has piqued your interest in Pandoc. I love the beautiful output of LaTeX but hate working with its syntax. With Pandoc I’m free to compose in Markdown, a language with a very lightweight syntax, and then convert into TeX when and if I want to. For those curious what the -w argument is about, it tells the shell to wait for the mate process to terminate (the file to be saved and closed). Read this for more information about how to associate TextMate with various other shell scripts and programs.